Occasionally when I'm out and about I'll overhear random strangers talking about the shop. 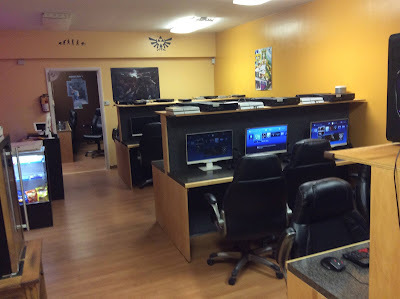 Most customers who have visited our shop have had an overwhelmingly positive experience, but there are still some people who scoff at the concept of a LAN Center and refuse to go. The thinking often goes "Why would I pay to play video games when I can just play from my bedroom at home?" We offer a lot of things that you just won't get at home. Don't own a PC and missing out on some of the finest video games in existence? Is your five-year-old home PC struggling to run Overwatch? Poor Internet connection causing you to lag out? At a LAN Center you can crank your graphics settings up to Ultra and play lag-free on a fast Internet connection. Enjoy games the way they were meant to be played! Our selection of games is also massive; it would take many trips and lots of energy drinks to play through them all. LAN Centers are hands down the best place to meet people who love to game. If there is a game you're really interested in, chances are there are one or more people playing that game at a LAN Center. You'll make quick friends and likely be introduced to other games that you didn't know existed but enjoy just as much. We have networked with gamers all over Central NY and even created local Facebook groups for our more popular games. Have a few hours to burn? Bored and looking for something to do? Have kids to entertain and need a few hours to yourself? Want to just game all night into the morning? We'll always have a new game in our rotation and players around the shop who will be happy to add you to the party. Even when the shop slows down you'll sometimes find employees keeping games going. Hang around the shop enough - especially when we're hosting tournaments - and you're bound to meet some highly skilled players. If you're serious about getting better at a game, a LAN Center is the best place to seek out someone to play and learn with. Have an amazing memory or story from our LAN Center to share? Comment below!